I tend to carry fair amounts of stress and anxiety in my life so I find that it is extremely important for me to take the time to properly relax and take sufficient ‘me’ time. One of the best ways I have found to do that is by having frequent Pamper Nights. For those who have never had a Pamper Evening, it’s quite simple and quite enjoyable. It’s a night where you decide to take the ‘me’ time that you need to do a little beauty & skincare regime that you normally rush through during the other days. It usually starts with a warm bath, some calming tunes and a delightful array of beauty, haircare & skincare products! I do Pamper Nights quite a lot so I thought I’d share some of the essential ingredients that make my Pamper Evenings such a smashing success. 1. Lush Bath Bomb – Bath bombs, bubble bars, bubble bath, bath salts, whatever your preference, this is a must have for any good Pamper Evening. It scents your bath to get you into a relaxed mood and can leave the water a gorgeous hue. My current favorite bath bomb at the moment is the Phoenix Rising bath bomb from Lush USA. The bath bomb is meant to be a tribute to a phoenix that is rising from the ashes. Its a beautiful royal purple, dusted in gold, with a cinnamon stick at the top. It sinks to the bottom of your bath and slowly rises up, like a phoenix rising from the ashes and gives your bath the delicious scent of spicy apple and cinnamon! This will definitely be a staple in my Fall Pamper Evening essentials. 2. Scented Candle – A scented candle is a must have for any of my Pamper Night. I tend to save all my sweet smelling, desserty candles for my Pamper Evenings. It makes me feel like I’m enjoying a decadent dessert on top of everything else! The candle that I currently have in my bathroom for every Pamper Evening is the Bath & Body Works 3 wick candle in Raspberry Peach Macaroon. Unfortunately, they no longer sell that one in the stores, but the Banana Nutmeg Bread pudding is another deliciously decadent scented candle that would make for a splendid Pamper Evening. 3. Lounge Socks – After I’ve washed, dried & moisturized, I love to slip my feet into soft shea-infused lounge socks. It’s a bit of extra pampering for my toes and it keeps them warm and soft, saving them from the dirty floors of my apartment! I picked up this pair at Bath & Body Works and I am completely in love with the little owls that look up at me every time I look down at my feet. They are so cute! 4. Face Mask – A face mask is an absolute necessity for any Pamper Evening. Your face deals with so much stress and environmental pollution throughout the day. It is very important that you take the time to cleanse and reinvigorate your skin. My favorite face mask at the moment for all of my Pamper Evenings is the Origins Clear Improvements active charcoal mask to clear pores. My skin tends to get very congested as the week rolls on and this mask does a smashing job of clarifying my skin and drawing out all the impurities. 5. Manicure – Although I am truly terrible at it, I like to try and attempt to give myself a manicure during my Pamper Evenings. It’s such a boost for me to go through the day and look down at my nails to see them all prim, proper, bright & beautiful. My favorite polish at the moment is Take it Outside from Essie’s new Fall 2014 collection. It’s a gorgeous taupe with just a hint of pink. A perfect polish for the start of Fall! 6. Hair Mask – I have quite long and thick hair. It takes some serious damage with blow-drying and styling, but thankfully never leaves me, so I like to give it a lot of love during my Pamper Nights with a deep conditioning treatment. My favorite deep conditioning treatment right now is the Macadamia Natural Oil Deep Repair Masque. It works like a magical, magical charm and leaves your hair with this amazing nutty scent! It definitely gives my hair that necessary bit of bounce and shine. As a little note, tunes are also an essential part of any of my Pamper Evenings. I love having soft, beautiful melodic music playing as I breathe deep and relax in my tub full of bubbles. One of my favorite songs that is on all of my Pamper Night playlists is Brooke Waggoner’s ‘Fresh Pair of Eyes‘. Ever since I heard it on Pretty Little Liars, I listen to it all the time when I need to take a beat and calm my mind. It’s such a beautiful melody. 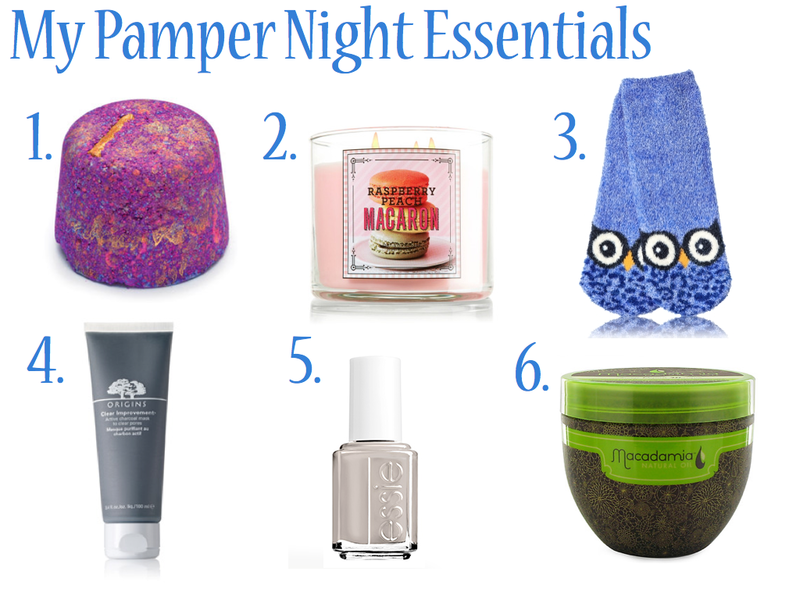 Have any Pamper Night essentials of your own? Share them with me in the comments below!